It seems to me that the key to Japanese culture is to realise that in the land of the rising mirror, the Japanese see themselves. This is evident in my opinion in the Japanese sense of private shame, Kyari Pamyu Pamyu eating eyeballs, Mariokart (Masuda, 2010), and birds eye view points in Ukiyoe (Masuda and Chang?) 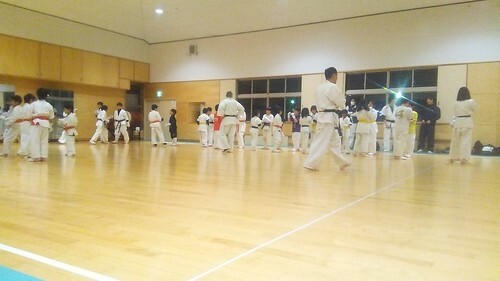 but above all, that this autoscopic ability may be closely linked with Budo and the Japanese arts. At the moment however the only good reference I have for this is the theory of the eye apart in the 14th-15th century Noh actor and theoretician Zeami who says that repeated practice of Noh forms allows the creation of Eyes at a distance (Riken no Ken) that look back at oneself. There is also a this book on the psychology of Budo by Takashi Ozawa (in Japanese) with a cover and belt (obi) that said that doing Budo one "obtains an other that looks at you" (but when I read the book and contacted the publisher it turned out that it was the publishers comment, rather than the author's). The cover image is great though. Similarly also this "Onore wo mitsumeru" (Staring at oneself) in Japanese where Ryo Nagano claims that in Iaido one is always fighting, and seeing, an imaginary opponent and that eventually one realises that his opponent is oneself, thus Iaido is an autoscopic martial art. And there is some research that a Kyudo practicing student of mine (Ikki Yamamoto) did that found that self-seeing or imagining correlated highly with archery ability (more than practice or anything else) since in archery as in Kendo, one is evaluated on form as well as lethality. It could be argued that the strong sense of aesthetics or grace in Nitobe implies autoscopy. The twofold gaze that Musashi Miyamoto in the Book of five rings does not mention autoscopy but it may well be especially "The Gaze in Strategy The gaze should be large and broad. This is the twofold gaze "Perception and Sight". Perception is strong and sight week. In strategy it is important to see distant things as if they were close and to take a distanced view of close things. " (近き所を遠く見る事 in the original) p14 "In large-scale strategy the area to watch is the enemy's strength. "Perception" and "sight" are the two methods of seeing. Perception consists of concentrating strongly on the enemy's spirit, observing the condition of the battlefield, fixing the gaze strongly, seeing the progress of the fight and the changes of advantages. This is the sure way to win. In single combat you must not fix the eyes on the details. As I said before, if you fix your eyes on details and neglect important things, your spirit will become bewildered, and victory will escape you." p3 40　and on p23 "You must make the best of the situation, see through the enemy's spirit so that you grasp his strategy and defeat him." does not mean see using the enemies spirit but rather "look at the enemies heart" ("敵の心を見" in the original). Re-reading the final single page chapter on the Void, I wonder what I mean by "seeing yourself" because there isn't one! But still it could mean several things! 1) Imagining how one looks from the perspective of others. 2) Seeing ones self representations, such as mirror reflections and first person views as representations and therefore at a distance 3) Seeing the void, the non-self, in which these occur. Judith Butler claims in "Bodies that Matter" that repeated (Derrida's "iterated") actions facilitate the creation of 'body as sign' which can be self-addressed, and be meaningful, "matter." There is also work on the overlap between theatre ('dramaturgy) and martial arts but I would not wish to suggest that Martial arts are a *performance for others,* so I tend to steer away from things dramatological. I do Karate a little and badly. I think that perhaps I may be able to see myself (with some pain!) more than than before. I don't know if Butler is right but it does seem to be, as Zeami can be read to say, that it is forms practice in Budo, tea, or 'radio exercises' (that all Japanese children do) that seems to be key. I find that doing forms in rows of other people helps in that I feel myself to be iterated in space as it were in the forms of the other people. Do others know of any other sources regarding self sight, autoscopy, or "sight apart" in the martial arts?